Please note: all chainRINGS are ring only, arms are not included but shown for illustrative purposes only. Please see further down for chainSETS which include ring and arms. As with our Disc and Track cogs these are CNC machined exclusively for VeloSolo by the UK's leading aftermarket motorcycle sprocket engineering company. Precision machined from heat treated high strength 4.0mm thick 7075-T6 aircraft grade aluminium alloy rather than the industry standard 3.0mm or 3.5mm. No offset so reversible without affecting chainline for longer life. Very stiff and very strong. Teeth are hobbed the old fashioned way for superb finish and performance. Classic style with machined cut-outs (42t has drilled lightening holes). Minimal lead chamfer and full height teeth with no cut-outs or 'shift pins' give perfect engagement with the chain. Designed for singlespeed and track use, not for geared bikes. The 135mm BCD is ideal for converting a classic Campag 53/39 square taper road crank (Centaur, Veloce, Record etc) to a single ring for fixed/singlespeed use. Variations include 130mm BCD in 1/8" or 3/32" width and 135mm and 144mm BCD in 1/8" only. The 1/8" width has nearly 50% more contact area for driving the chain than the 3/32". All BCD's available in sizes 42t, 44t, 46t, 47t and 48t. The 47t is great for multiple skid patches. Note: New options gradually coming into stock include 43t, 45t & 49t. UPDATE: Currently we have a limited choice in these new sizes but other variations are coming soon. All rings are anodized black. UPDATE September 2018 - GOLD is now being phased out, once the existing stock of gold have been sold we will discontinue this colour. The only options now left in gold are: 130mm 1/8" 44t and 144mm 1/8" 48t. All with laser engraved logo. Please see this page for sample weights of VS components. Please see FAQ for chainring bolt advice and how to measure BCD etc. 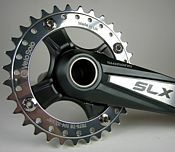 These are the exact same chainrings as the black and gold models above but in a silver anodized finish to replace the discontinued polished rings. Variations include 130mm, 135mm and 144mm BCD in 1/8" with tooth sizes of 42t, 44t, 46t, 47t and 48t. In addition the 130mm BCD option is also available in 3/32" width in the same tooth sizes. Note: options currently OUT OF STOCK in SILVER are: 144mm BCD 1/8" 46t. 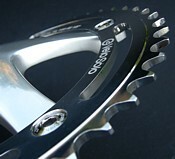 Exact same chainrings as our anodized models but in custom polished finish. High quality full polishing to both sides including inside cut-outs etc. Same laser engraved logos as above. Please note that traditionally polished items may tarnish over time due to weather, normal use etc and may require cleaning or re-polishing - we recommend 'Peek' (easily found on eBay). As above, the polished 135mm BCD is ideal for converting a classic Campag 53/39 square taper road crank (Centaur, Veloce, Record etc) to a single ring for fixed/singlespeed use. Or if you have a Shimano (Ultegra, Dura Ace etc) road chainset choose the 130mm BCD. NOTE: these are being DISCONTINUED - we have very few black and red still available. Again, exact same technical specification as above rings but in solid design with no cut-outs (as per Sugino Messenger style). Perfect to match our 'large logo' track cogs. Available in 130mm BCD in 1/8" width and with 44t. Available in anodized blue, red or black with large laser etched logo and no other markings. 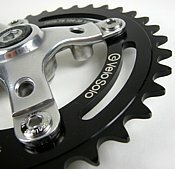 Royce NOS 144mm BCD Polished Track Chainring - update, last few found! As with the SR rings below these are a recent and very rare warehouse find and are stunning chainrings. Many riders will remember Royce as a highly respected niche UK component manufacturer in the 80's and 90's, primarily known for bottom brackets (supplying the BB for Chris Boardman's '92 Olympic Gold Medal bike). 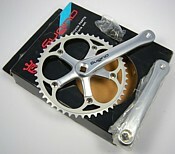 Back in the day (early 1980's manufacture) these chainrings were aimed at Campag Super Record and high end Track riders. Like our own VeloSolo rings these have a traditional look and are finished in natural polished. They are quite cutaway and very light (45t is 56g). Width is 3/32" and BCD is 144mm only. Very limited stock available with 43t, 45t, 46t, 47t and 51t. Now only 53t or 57t Wiggo and Cav 'dinner plate' sizes left! 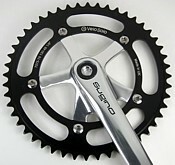 See pictures for comparison to VeloSolo 44t ring and 16t cog (not included). Once these are gone we shall not see them again as they would be so expensive to produce. VeloSolo have never made rings this size and like most chainring manufacturers we have found that polishing rings is totally un-economical especially ones this large. Usable with a 3/32" or 1/8" chain. Note: being genuine NOS these have been in a warehouse for over 30 years. Generally they are in superb condition but some may have some light tarnish in places or the odd small scratch or blemish but this can easily be improved with a quick polish with 'Peek' (our recommendation) metal polish or similar. 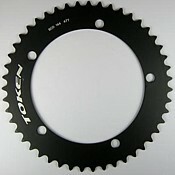 A range of high quality chainrings from Token for traditional 144mm BCD chainsets. We are stocking sizes 44t, 45t, 46t, 47t, 48t, 49t, 50t, 51t and 52t. All in 1/8" width. Anodized black with Token logs. Designed for singlespeed/fixed and track use only. Note: discontinued by Token, last option in stock is the 48t in SILVER (NOT black). All other options now unavailable. An alternative to our own VeloSolo chainrings. These are excellent quality machined rings made in Europe with full height teeth and no cut-outs or 'shift pins'. Designed for singlespeed and track use. Other tooth sizes available to order - please email for more. We keep the 42t, 43t, 44t, 45t, 46t, 47t, 48t, 49t and 50t in 1/8" in stock in all three common BCD patterns; 130mm, 135mm and 144mm. Please see FAQ for more on BCD. New smaller size 40t now available in 130mm BCD only (silver or black). 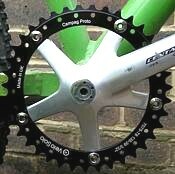 IMPORTANT: All chainrings are now 'plain' and and do NOT have logos (some pictures show older models with logos). As above but now available in black finish. Machined rings made in Europe with full height teeth and no cut-outs or 'shift pins'. Designed for singlespeed and track use. 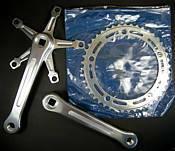 Stronglight Singlespeed MTB or Road 3/32" 110mm BCD Chainring - NEW! 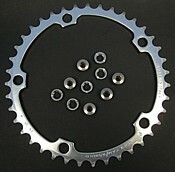 We are now offering a great value line of 110mm BCD chainrings from Stronglight. 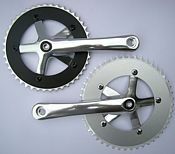 Ideal for converting a MTB or road bike to singlespeed or to replace a worn middle chainring or use with a 1 x 9, 1 x 10, 1 x 11 set-up etc. Use off-road or on-road. High quality machined 5083 aluminium ring made in Europe with full height teeth and no cut-away areas. Options include 36t, 38t, 39t, 40t & 42t. All anodized silver and very lightweight. BCD is 110mm with five mounting holes. Please measure the distance between the centre of two adjacent holes and the measurement should be 64.7mm. Compatible with all 3/32" chains. 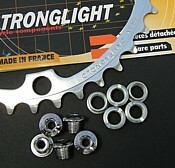 Stronglight Track 2000 Chainset Complete - SPECIAL OFFER! 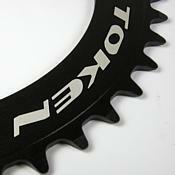 High Specification cold forged 2014 T6 heat treated track chainset in 165mm or 170mm. BCD of 144mm. Incredibly stiff and strong. 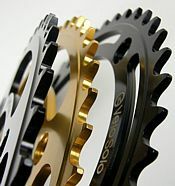 Complete with beautifully CNC machined 1/8" 48t 7075 black anodized chainring. Include self-extracting crank bolts. Polished finish with laser etched logo. Made in France. Highly recommended. See Road CC for a review. Requires 107mm bottom bracket with JIS (Shimano type) taper - see here for matching BB. See FAQ for advice on different BB tapers. Special offer price at £99.95 (RRP £139.95). A superb chainset from Andel (arms only, see below for model with chainring) - manufacturer for many well known US bike component companies. This is a very traditional design obviously styled after Campagnolo Nuovo Record and other chainsets of that period. Forged lightweight arms with CNC machined flutes to arms and spider. Polished finish. Available in two lengths of 165mm or 170mm. BCD is 144mm. Use with 1/8" or 3/32" chainrings. Note: there is occasionally a slight issue with the cranks and non-Andel rings. There may be a slight step (0.5mm or less) on the spider of the arm which does not affect the slightly larger diameter (inner bore) Andel rings but may affect others. To fit certain non-Andel rings perfectly flush you may need to modfiy and remove a very small amount of material from the step or the inner part of the chainring. Chainring bolts and crank bolts are included with the arms. Requires 110mm bottom bracket with JIS (Shimano type) taper. See bottom brackets for more and FAQ for advice on different BB tapers. A new option to compliment the model above. This is a complete chainset from Andel ready fitted with a beautifully machined Andel CNC chainring. Available with a choice or 44t, 46t or 48t in 165mm length or 170mm with 48t. 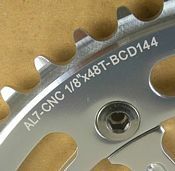 All chainrings are 1/8" width in 144mm BCD with laser engraving. 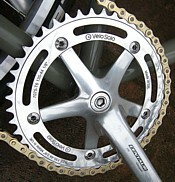 Same fluted arms as above with traditionally styled 'slotted' chainrings. Polished finish. New black option available in 165mm length with 48t 1/8" chainring. Requires 110mm bottom bracket with JIS (Shimano type) taper. See bottom brackets for more and FAQ for advice on different BB tapers. These are superb value and ideal for fixed wheel or singlespeed road bike builds and conversions. 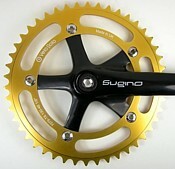 Style very similar to the Sugino Messenger with a 'solid' type chainring, quality similar to the FSA Vero. Forged aluminium arms with polished finish and machined aluminium chainring in 44t, 46t or 48t (170mm in 48t only). BCD is 130mm. Choice of 165mm or 170mm lengths. 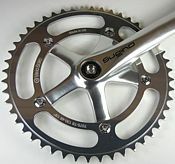 The 165mm has a 1/8" chainring in black finish with 44t, 46t or 48t, the 170mm has a 3/32" 48t chainring with silver finish (also usable with 1/8" chain. Complete with crank fixing bolts. Requires 103mm bottom bracket with JIS (Shimano type) taper. The manufacturers approximate chainline is 42mm with a 103mm BB (please note though that in practise chainline will be an approximation due to variables in BB shells and crank and BB spindle tapers etc so it should only be seen as a guide especially with budget chainsets). See Tange bottom bracket for more and FAQ for advice on different BB tapers. This is the classic Messenger chainset. Cold forged black anodized arms in 165mm with a 44t 1/8" machined chainring (other sizes available to order - please email). Also available with polished arms/black ring or polished arms/silver ring. Complete with securing bolts. Matching chainring with 'Messenger' logo. BCD is 130mm. Usable with 1/8" chains. Requires 103mm bottom bracket with JIS (Shimano type) taper. See bottom brackets for more and FAQ for advice on different BB tapers. Superb quality Sugino track chainset with cold forged and polished aluminium arms. Complete with 48t 1/8" machined chainring and crank arm securing bolts. BCD is 130mm, arms available in 165mm. Usable with 1/8" chains. Requires 103mm bottom bracket with JIS (Shimano type) taper. See bottom brackets for more and FAQ for advice on different BB tapers. Bottom Bracket Crank Bolts Standard Type - special offer buy one pair get two extra pairs free! Standard crank bolts for use with any bottom bracket (Tange, Shimano, Sugino etc) and any cotterless chainset. Grade 10.9 high tensile steel in black finish. Use with a 14mm socket or crank bolt tool (YC-161) etc. Sold as a pair. As above but 'modern' allen key type with 'built-in' dust covers. For use with any bottom bracket (Tange, Shimano, Sugino etc) and any cotterless chainset. Chromed steel. Use with an 8mm allen key. Sold as a pair. 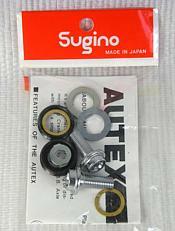 These are a slightly higher spec alternative to the Zenith bolts below and made by Sugino in Japan. All steel construction with brass washers. By using these instead of regular crank bolts you will not need a crank extractor tool to remove your chainset. However, these do require care in use. 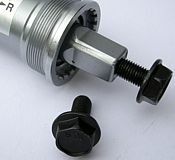 The 'cap' screws into the crank arm over the bolt, undoing the bolt allows the shoulder of the bolt to pull against the cap removing the arm. For use with any square taper bottom bracket and cotterless chainset. Sold as a pair. Simple to install with just one regular 6mm Allen Key and the special Sugino tool (included). Important: To avoid damage please ensure these are fitted correctly. If the cap bolts are not properly fitted to your crank arms you may damage your crank threads. The crank threads must be perfectly clean and undamaged. Full fitting instructions included (please be sure to grease all parts). Lighter weight budget version of the Sugino above. These have a hardened steel bolt with a lightweight aluminium cap. For use with any square taper bottom bracket and cotterless chainset. Sold as a pair. Requires 8mm and 10mm allen keys for installation. Important: To avoid damage please ensure these are fitted correctly. If the cap bolts are not properly fitted to your crank arms you may damage your crank threads. The crank threads must be perfectly clean and undamaged. Grease the thread of the bolt, install into the crank arm and pop the plastic washer on top (no grease). Using a 10mm allen key or hex wrench fully tighten the alloy cap into the arm with Loctite or similar. Install the crank as normal with an 8mm allen key. Set of five chainring bolts in steel for securing single chainring to crank arms. Attractive bright chrome finish with Stronglight branding. Also ideal to replace the (too) long bolts when converting your own double or triple MTB or road chainset to a single ring for singlespeed use. These are slightly longer than Zenith below and more suitable, for example, when converting a double Campag chainset to single by swapping inner ring to the outer position. 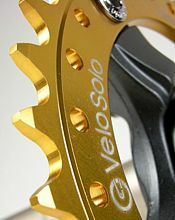 For VeloSolo chainrings see Zenith bolts below. Please see FAQ for chainring bolt advice. Set of five chainring bolts as above but in stainless steel. Note: VeloSolo chainrings have deep recesses for the bolt heads and often require shorter bolts - therfore the Zenith here being around 1mm shorter than the Stronglight are usually the ones to choose but as above please see the FAQ for chainring bolt advice before making a purchase. Set of five chainring bolts in stainless steel for securing two chainrings to crank arms. 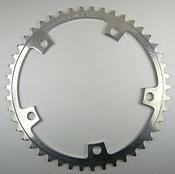 Suitable for double road chainset or for middle and outer rings on mountain bike chainset. Also usable with chainring spacers (see below) if single bolts are coming up a little short. Please see FAQ for chainring bolt advice too. These are also the bolts to use if mounting a single VeloSolo chainring on the opposite side to normal on a crank (ie outer position on a MTB chainset or middle position on a road chainset). Very useful little fellows. Allows longer (double) chainring bolts to be used with a single ring instead of two when converting to singlespeed. Or mount between chainring and chainset to move chainring in or out in small increments to perfect front chainline. Set of five in aluminium alloy, machined in the USA. Available in 0.6mm (now sold out) or 1.2mm thickness. Please see FAQ for chainring bolt and spacer advice.